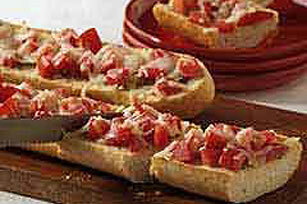 Give classic garlic bread a tasty makeover with this Italian Tomato & Cheese Bread recipe. Make this Italian Tomato & Cheese Bread in just 25 minutes. Preheat oven to 400°F. Place bread halves, cut-sides up, on baking sheet. Mix oil, garlic and seasoning; drizzle over bread. Sprinkle with tomatoes and cheese. Bake 10 to 15 min. or until cheese is melted. Cut each bread half crosswise into 10 slices to serve. Practice mindful eating by savoring the flavor of this cheesy bread and sticking to the recommended serving size.